Jobs of the future will involve creativity, unpredictability and empathy. Can such complex skills be taught to today’s graduates? As automation comes to the fore, how will jobs be affected? Only work that involves genuine creativity, complex human relationships and unpredictability are most likely to survive, tech futurists warn us. The ‘human touch’ will always be in demand. Therapists, mental health workers, educators, curators and choreographers are all high on the list of jobs likely to be safe from robots, according to a well-cited study by Oxford University. 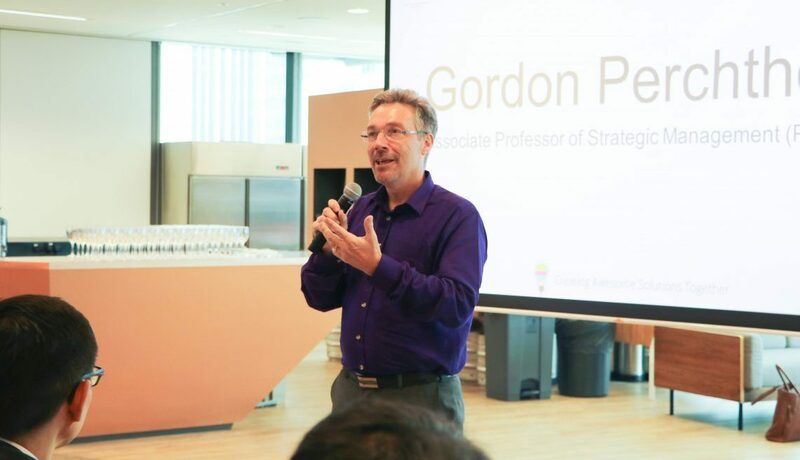 Gordon Perchthold, Associate Professor of Strategic Management at the Singapore Management University (SMU), agrees. The university is training its undergraduates for professions that require varying degrees of empathy, human interaction, creativity, and problem-solving, he says. First, comes theory; next, comes application. Perchthold’s final-year students undergo a capstone project, where they gain “experiential knowledge” and exposure to what working life can be like – which can be rather different from their years of studying in a university setting, he notes. In the capstone programme, SMU’s partner companies provide problem statements that they are trying to solve, and students must work closely with these companies’ senior executives to propose solutions at the end of their final term. Here is where theory does come in handy: participating students must identify the right customer profiles for their proposed solution, and define the value proposition for them. They must create detailed business plans to tackle the challenge, showing what kind of resources they need, what costs the company will incur, and what revenue model should be used. The real learning begins when students realise that people are unpredictable – and coping with such ambiguity will be one of their biggest challenges, Perchthold believes. They have to learn to deal with moody colleagues and difficult customers. “You’re working with clients, and you have a problem but there’s not necessarily any solution or one that they can actually envisage right off the bat,” he says. Every team has an exchange student as a member, he adds, which helps students to consider and accept perspectives outside of their own. “You get some international experience and diversity of thinking,” he remarks, adding that creative skills are dependent on students being able to “observe non-conforming data”. Equally, companies are keen to get fresh ideas on how to solve various business problems. “For the clients that participate in the programme, it allows them to tap into the minds of a younger generation which they don’t normally interact with,” says Perchthold. One of the challenges posed to students this year was to think of how insurance company Prudential could attract millennials and grow its pool of next-generation talent. “These are real case scenarios that we face,” says Yan Renyi, Prudential’s Head of Culture. Echoing Yan’s observation, research by one of the capstone teams revealed that millennials have a poor understanding of the career prospects available in the insurance industry, and that their knowledge was mainly sourced through word-of-mouth. The team also conducted surveys which showed that millennials care most about the prestige associated with employers’ brands, with career progression also a top priority. Such findings will help Prudential “reposition” itself, SMU’s Perchthold says, to become more relevant to younger generations. Indeed, it is never too early to develop a mindset of creativity and empathy, as well as acquire the ability to deal with ambiguity and uncertainty. With this principle in mind, Prudential Singapore is working with secondary school students to do just this. The company is a lead collaborator in the Prudential Young Trailblazers programme, where 200 students are currently working to develop practical solutions to real-world problems faced in healthcare, well-being, financial literacy and education, among other areas. For sure, there are some tasks that simply cannot be delegated to our future robot colleagues. The ability to empathise, think creatively and develop deep relationships with others will stand millennials’ careers in good stead.